Good morning! 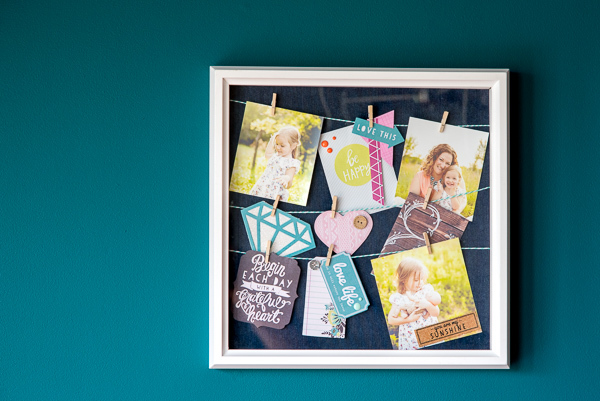 Jen McDermott here to share an easy and reusable way to display your photos! I love shadowboxes, but with four small kids that are always changing, I want the flexibility to change up my photo display without having to take it all apart. So, I created a clothesline shadow box with itty-bitty clothespins, so I can switch out the embellishments as I wish! First, I grabbed a white shadowbox from a big box craft store. Then, for my background, I wanted something timeless that could go with any season of the year. So, I went with our denim paper, because you know, JEANS go with EVERYTHING. (How cute will this be with a patriotic theme for the 4th of July?! And in fall colors when I switch it out in October??) Then, I affixed the WeR baker’s twine to the back of the page using tape, keeping the lines a little bit wonky. I gathered up my papers, embellishments and photos, and started arranging them on the clothesline. 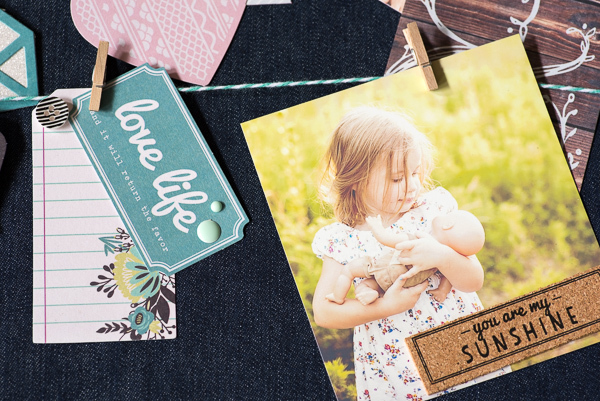 I LOVE the Hello Darling collection for this project because the colors really compliment my photos and the the denim paper. I used a journaling card from the Noteworthy paper, and even used the little strip at the bottom for an accent. I also threw in several pieces of the Ephemera Bits and used one of my gem dies with sparkle paper to add some more interest. Then I threw on a few more embellishments, including the cork stickers, and placed it all in the box, ready to be displayed! Designer photo tip: when taking pictures of children, get down to their eye level; don’t take pictures from above. 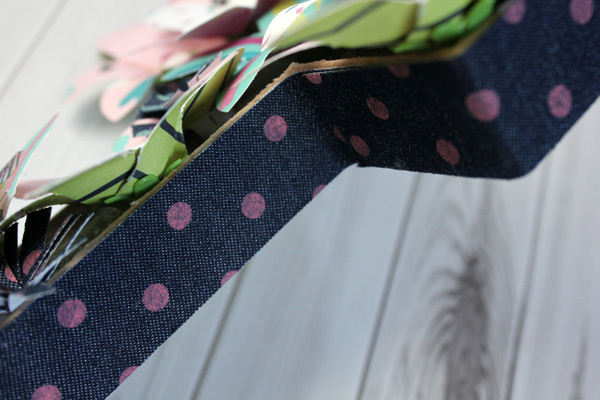 I just love how versatile this project is, and I’m already thinking of ways to make it summery! How about you? Do you use clotheslines creatively in your home? Share with us here and on our Facebook page! Hello We R fans! It’s your blog hostess, Aly Dosdall again. When planning photo display projects sometimes it’s fun to think outside the box a bit. 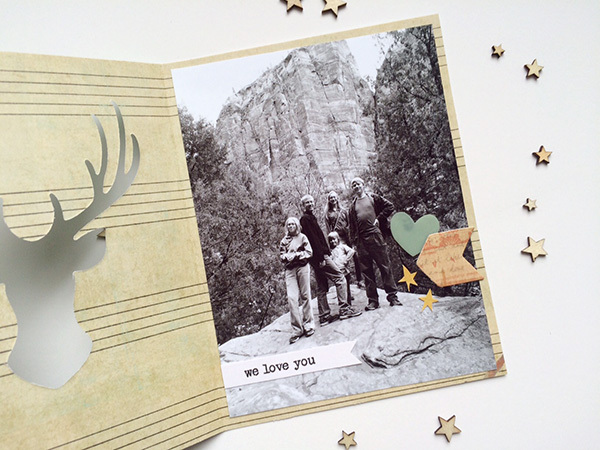 For example consider die cutting your photos into shapes rather than using traditional rectangles like I did with my Summer Snapshots Photo Display. 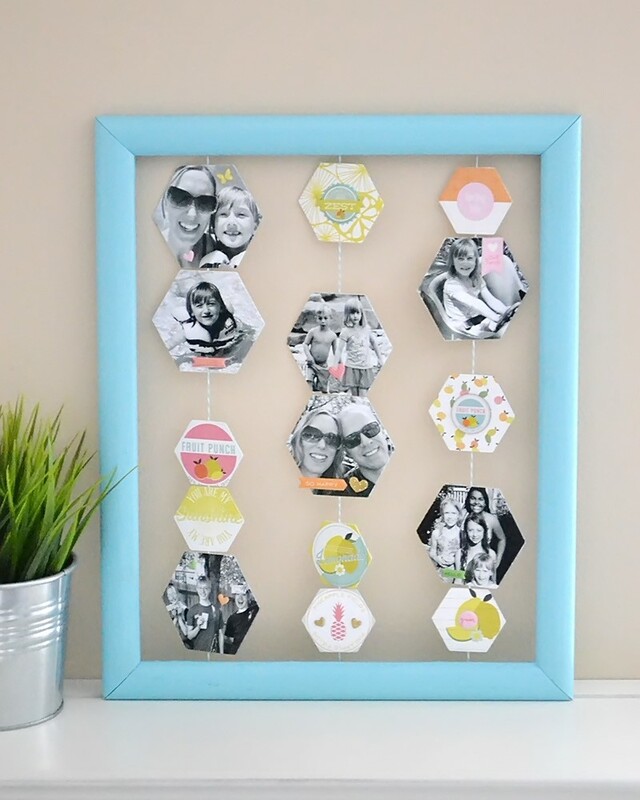 With my Evolution Advanced and the Hexagon Nesting Dies it was easy to give this framed photo display a unique look. Summer is such a fun and memorable time for our family, so I wanted to create something to display our favorite photos from last summer. Photo tip: I converted all of my photos to black and white and then printed them since all of my photos were from different moments during the summer and I wanted my project to have a cohesive feel. After printing my photos I selected three of the smallest dies from the Hexagon Nesting Dies set. I used the larger one to cut my photos, then skipped a size and used the smaller two to cut my patterned paper and journaling cards. I placed my photo on my Evolution Magnetic Mat B and then my die upside down on top. Then I ran it through my Evolution Advanced, and repeated this step for all my photos and papers. I then used a staple gun to attach three lengths of baker’s twine to my frame. Next I cut a matching back for each photo and paper out of white cardstock, covered it with adhesive, and attached my photos and papers to the twine by sandwiching it between the photo/paper and its backing. To finish off my project I added some stickers to my photos and papers from the fun summer-themed Citrus Bliss collection from our sister company, Pink Paislee. 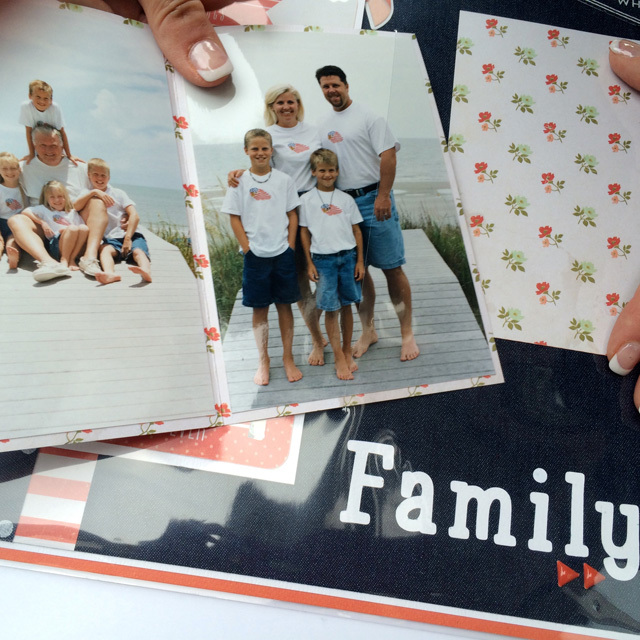 I love how the unique die cut shape of the photos and papers looks for this photo display. And I love how easy it was to make using my Evolution Advanced! If you love to create projects with your Evolution Advanced, we’d love to see them on our Facebook page. 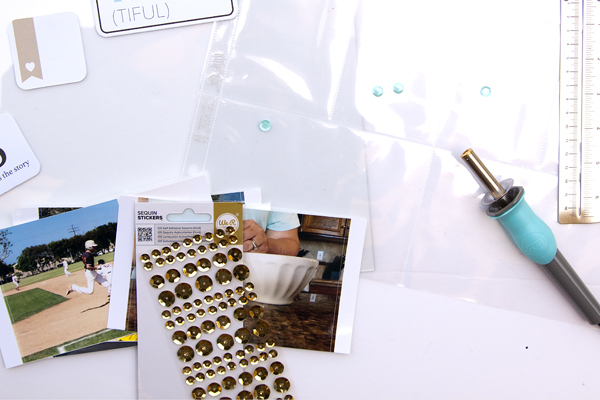 Hi everyone, it’s Traci and today I’ll be sharing a tip for adding lots of photos to a 12×12 page. I use this technique in my mini album kits and custom scrapbook pages all the time. 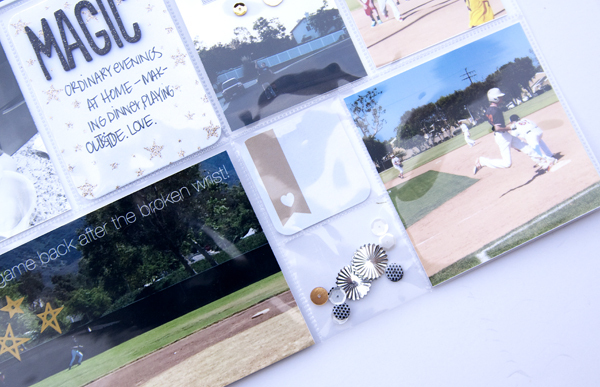 When a client requests a custom album they often want more photos on a 12×12 page than will traditionally “fit”. My solution? Cards that flip-up or fold-out to reveal additional photos. First, I created my 12×12 base page. For this layout I used the new Denim Blues paper . Once I had the base and overall design, I looked at the photos to consider size. Could several photos be cropped to 3×4? 4×4? another size? 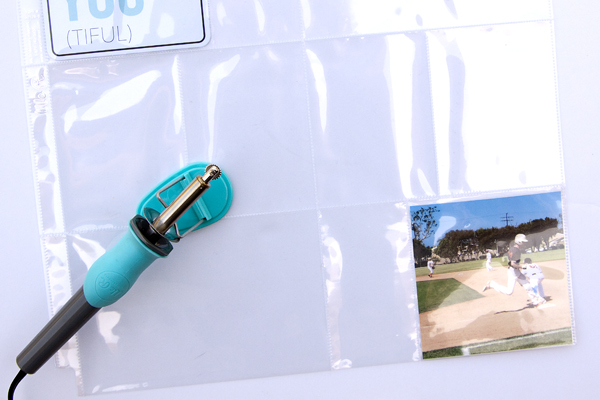 The key to adding lots of photos is a flip-card that will hold three photos…one on the front, and two inside the card. For my first card, the photo is 4×4. The We R Memory Instagram overlay frame is 4×4, so I chose to make my flip-up card 4.25” x 4.25”. My base card stock needs to be 4.25” x 8.50”, with a score line at 4.25”. For this layout I have two 4.25×4.25” cards and one 4.25×6.25” card. In order for me to be able to open the cards from the outside of my plastic page protector, I used a craft knife to create a slit in the plastic. I slid the page into my We R Memory Keepers Page protector and laid the photo cards down on top of the plastic. Then I gently cut slits in the plastic along each of the card’s fold lines. I added adhesive to the back of each card and slipped the backs through the slits so that the card now opens from outside of the page protector. 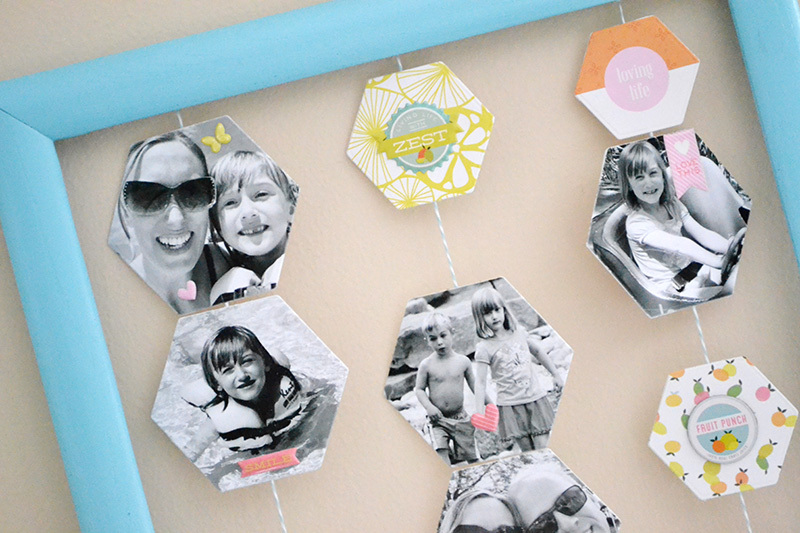 Thanks for letting me share this fun way to get lots of photos on a page! We would love to see your layouts so please share pictures with us on our Facebook page! Thanks for stopping by! Hi there, it’s Aly with you today. 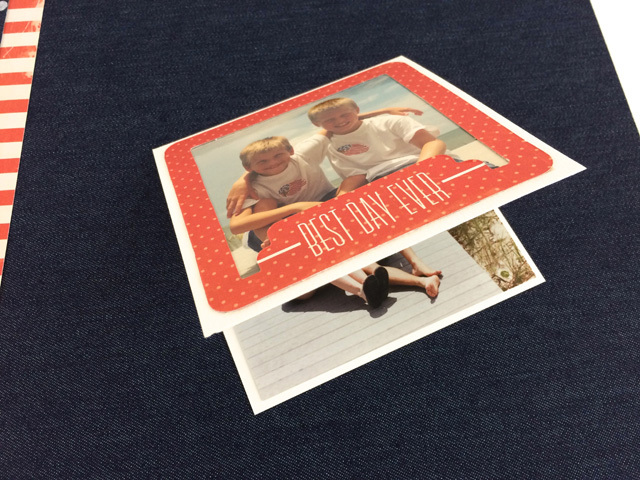 Special occasions are the perfect opportunity to include photos on your handmade cards. Moms, dads, grandmas and grandpas love to receive photos of the littles, and photo birthday or holiday cards are so much fun. 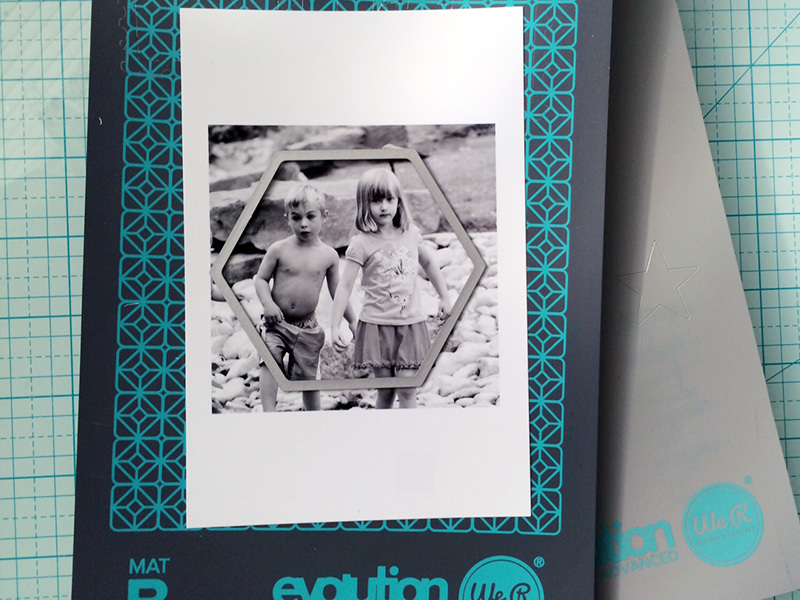 Here’s an easy idea for including a photo on a Father’s Day card using the Evolution Advanced. 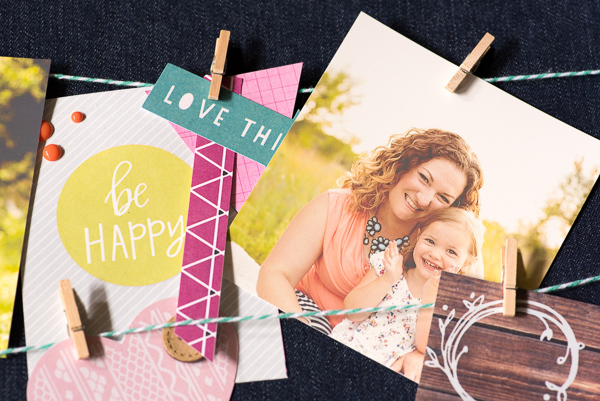 To create this photo card I started by trimming a piece of patterned paper from the Shine collection and trimming it to 8 1/2″ x 5 1/2″. 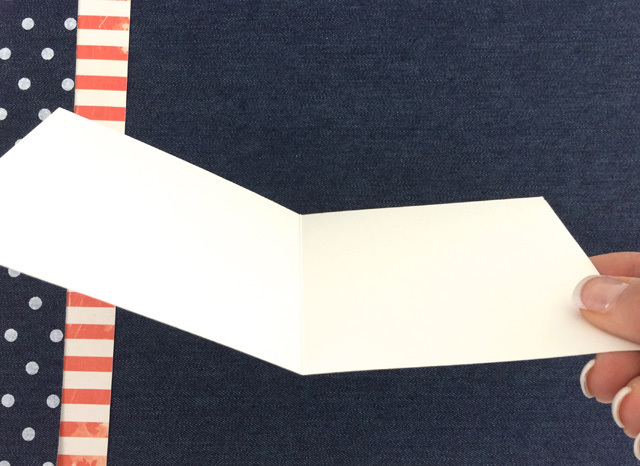 When folded in half this creates a 4 1/4″ x 5 1/2″ card. I chose a paper that was semi-solid and contrasted well against my black and white photo so that the antler shape is easily distinguished. 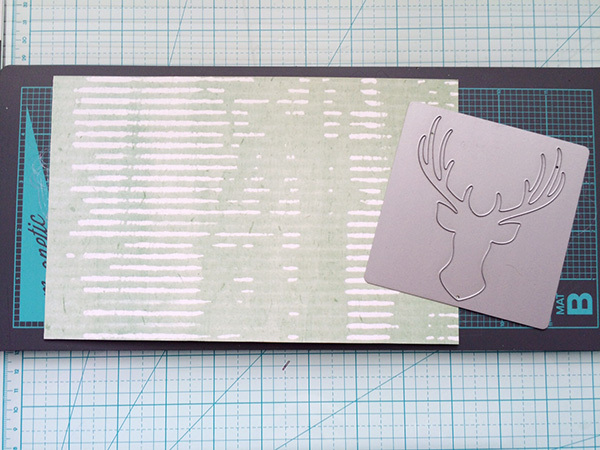 Next I placed my paper on my Evolution Magnetic Mat B facing up with the Antler Die facing down on the right half of the paper (since that side will end up as the card front once it’s folded). The magnetism of the mat holds the die and the paper in place. Then I placed the platform upside down on top of the magnetic mat and ran the “sandwich” through my Evolution Advanced. 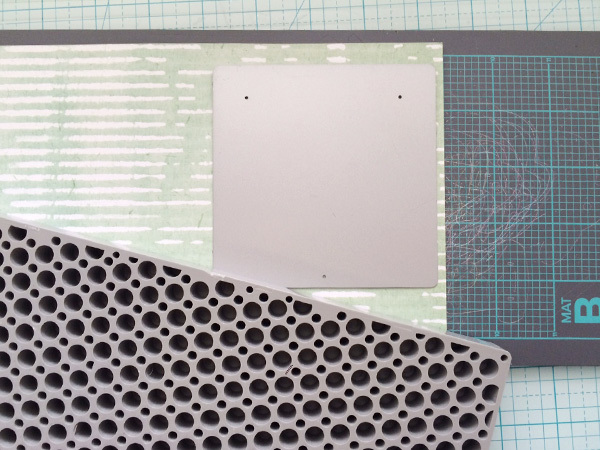 I removed my die cut paper, folded it in half, and adhered my 4″ x 5 1/4″ photo inside. Photo tip: Use the rule of thirds when composing your shots like I did in the photo above. See how my kids are positioned on the bottom third line? Next I added some flat embellishments and a computer-generated sentiment. To finish off the card I embellished the front and added another computer-generated sentiment. 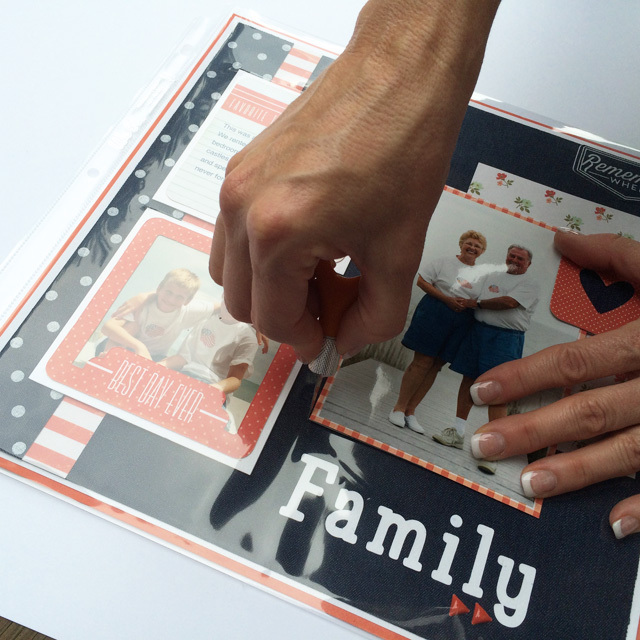 We scrapbookers get to enjoy a lot of fun celebrations in the spring–March is National Craft Month, in early May it’s National Scrapbook Day, and May is also National Photo Month! 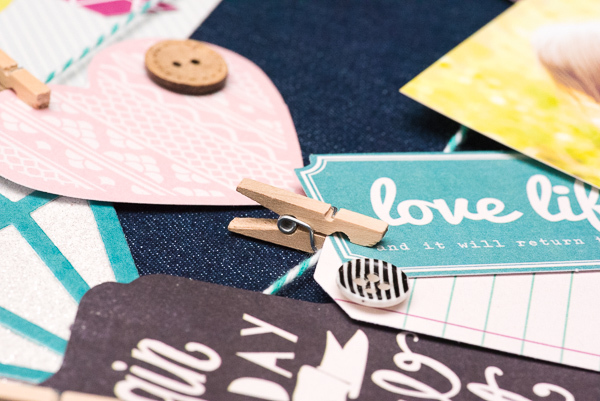 We already had an awesome party with you all for National Scrapbook Day, so in honor of National Photo Month we’ll be featuring projects with photos all week long. Enjoy! Hello, We R Memory Keepers fans! 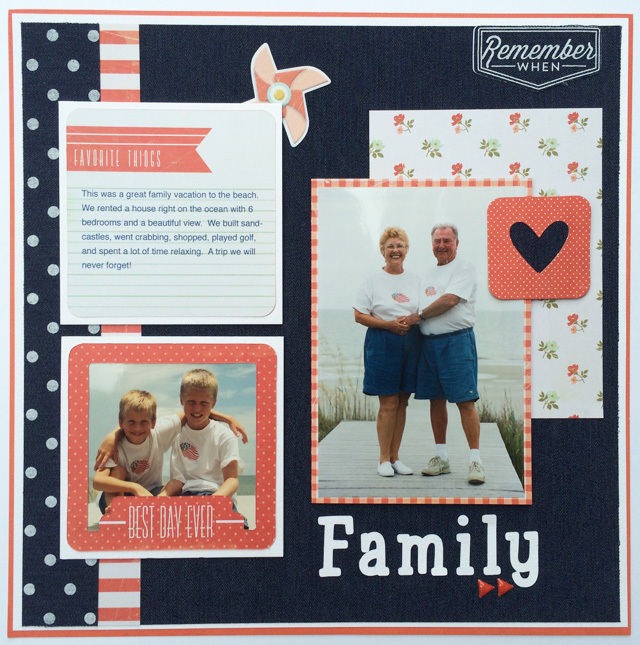 Jennie McGarvey here today to share a pocket page I created. I was very excited to use the The Fuse for the first time. I knew it was going to be so fun create custom pockets and it was! I kinda want to ignore all of the rest of the things and just FUSE! 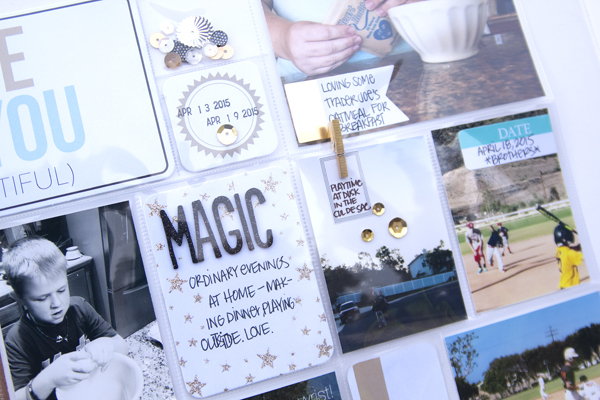 I sat down with the Fuse, plus fun bits and pieces from my stash, the Teresa Collins Studio Gold Albums Made Easy Journaling Cards 3×4 and the Teresa Collins Studio Gold Journaling Cards. The first thing I did was take two of the 4×6” slots and put a 4×4 Studio Gold card in one and a 4×4 photo in the other. Once I finished that, I used the Fuse tool to take the other 2×4 section and create 2 2×2 spots perfect for a Studio Gold card + some loose sequins. Designer Tip: For best results, use the Fuse Tool in a slow and steady manner. Too slowly and you’ll melt more than you need. If you go to quickly, you will not seal the pockets fully. Once I was finished Fusing (I wasn’t sure I would ever finish I had such fun! I kind of wanted to Fuse all of the things!) 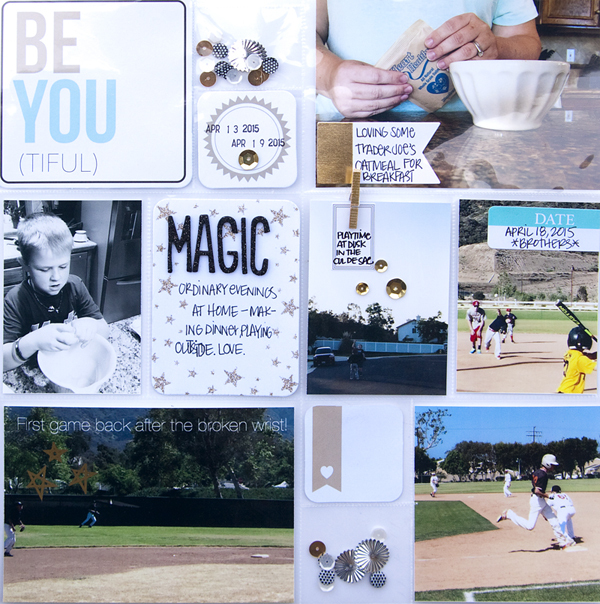 I was left to fill the rest of the pockets with cards, photos and embellishments. I’ve already created another pocket page on the backside of this page, because it’s just so much fun! Have you used your Fuse tool yet? 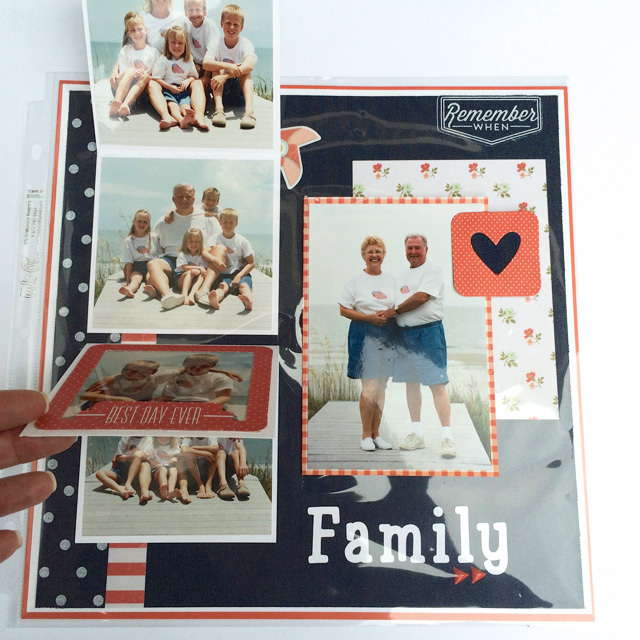 Make sure to tag We R Memory Keepers on Instagram or upload your projects to our Facebook page. We love to see how you are using our products! Hello! Samantha here on the last day of Flower Punch Board week. I’ve loved seeing how versatile this tool is, and today I thought I’d add one more use to list. Today I’m using my Flower Punch Board to make flower letters. You’ll need a paper mache letter (or letters). I ordered mine on-line, but they can be found in many craft stores as well. I’m using the letter “T” for Taylor. 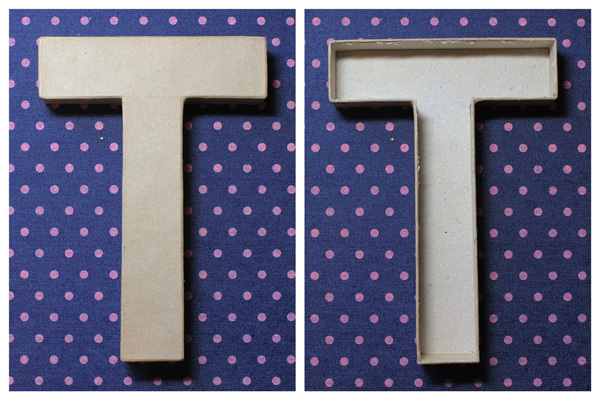 I started by cutting the top off of the T. You’ll only need the box part (the part on the left in the photo below). Next, I covered the outside of the T with Denim Blues Pink Dot. You could use any paper to cover the outside of the letter, but because Denim Blues is fabric paper, it bends and hugs the curves of the letter really beautifully. Then it’s time to break out the Flower Punch Board. 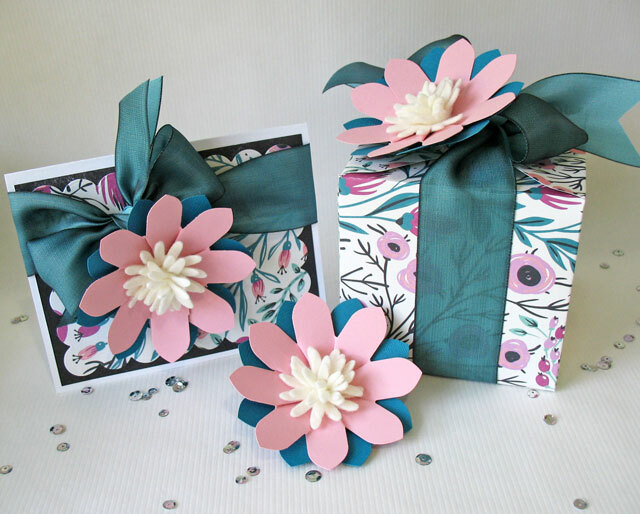 I created a bunch of 3” (XXS) flowers from Hello Darling paper. Even though I won’t be using long stems on these flowers, I still used the centers from the Flower Stem Kit to secure the flowers, and add a pretty center. I put some dry flower foam inside the T and used planted my paper flowers into the foam pressing the center of the flower (from the Flower Stem Kit) firmly into the foam. 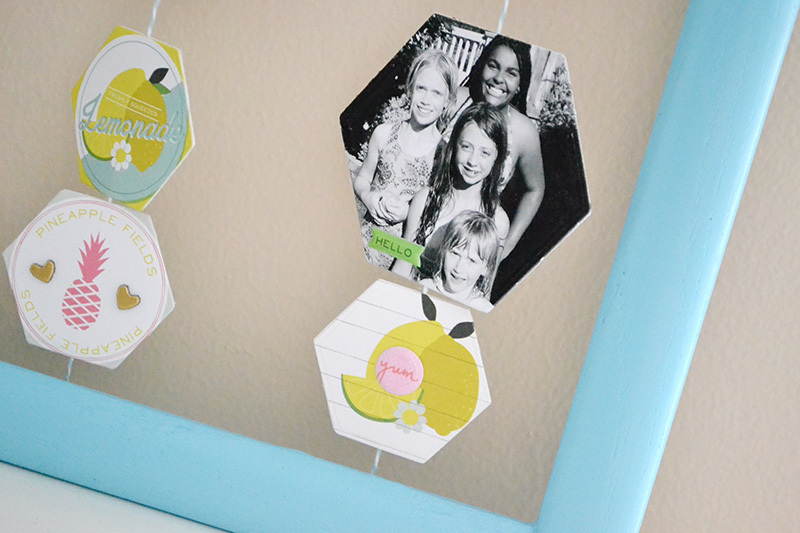 If you’ll be hanging your letter vertically, you may also want to add a little glue to the stem. It’s easiest to start in the center of your letter and work your way out. Finally, I made a few small fringe flowers from some Denim Blues fabric paper and attached them to the T as well. 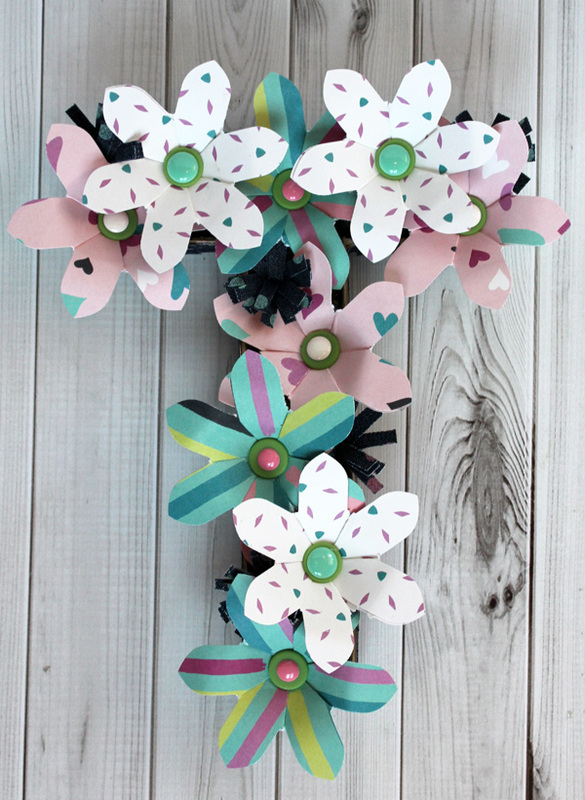 I love how fast and easy paper flowers are to make with the Flower Punch Board. I created a single flower letter, because I’m using this as a front door decoration, but there are so many ways to use these letters. For a wedding you could make the happy couple’s initials or a pretty “MR & MRS”. For a baby shower you could spell out “BABY” or the baby’s name if it’s known in advance. For home décor you could spell out “FAMILY” or “LOVE”. There are just so many fun possibilities! What letter or letters would you fill with flowers? 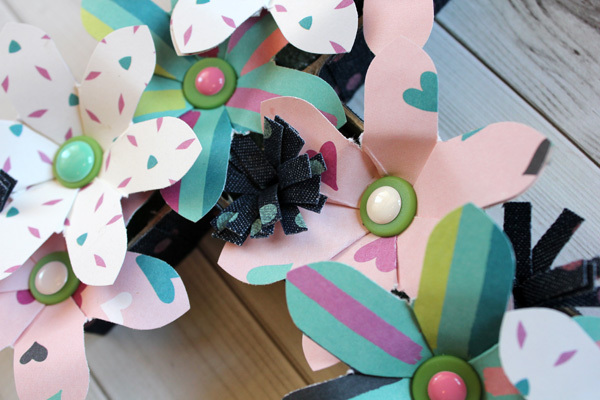 Most of our flower project inspiration this week includes paper flowers, so I thought it would be cool to share a past blog project using real flowers and paper wraps. You can check out the original post about these doily flower wraps to get all the details. 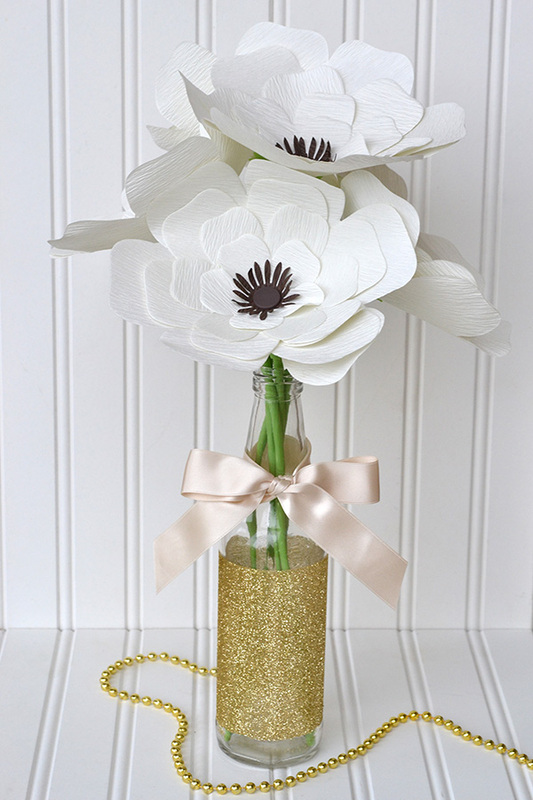 These beauties would make great favors for a bridal shower, garden party, or luncheon. Teachers would love them, and they’re perfect for neighbors or girlfriends. All you need is a circle cutter, your Evolution Advanced, a doily die, some twine, and some tags. Oh, and your favorite spring blooms of course. Enjoy! Hi everyone, it’s Traci and I’m glad to be back on We R’s blog today. I’m a huge fan of all of the We R Memory Keeper punch boards. 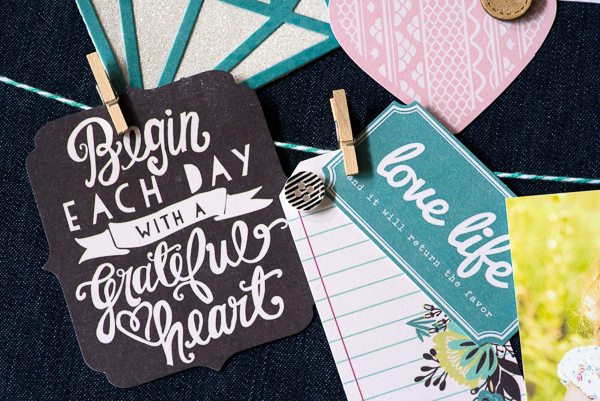 From envelopes and boxes, to banners and pinwheels, these punch boards really make paper crafting fun and easy! 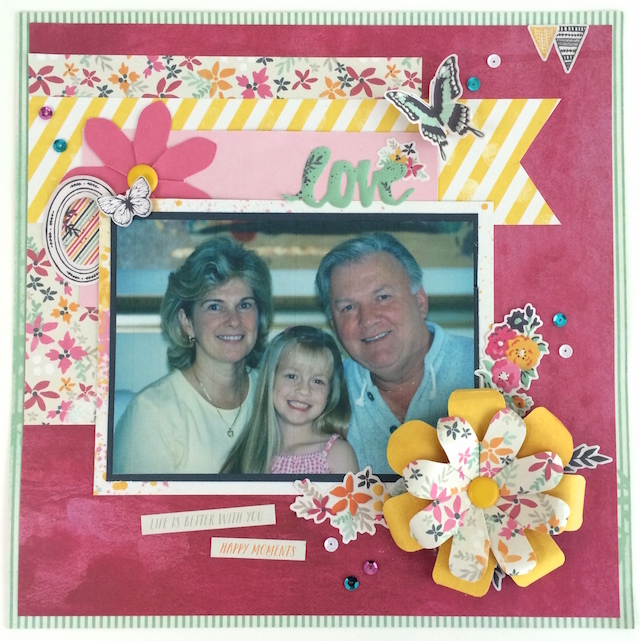 I decided to use the Flower Punch Board on this layout about my niece and her Papa and Meme. 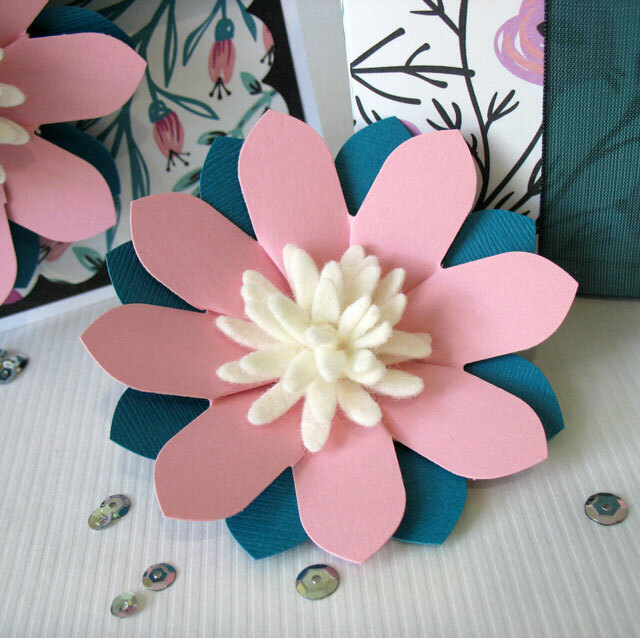 I wanted lots of dimension on this layout, so I used the petal curler that’s included in the board to bend my petals. I layered the 3” and 4” sizes and then added a brad to the center. I left the flower in the upper left corner flat and added a brad to the center of this one too. 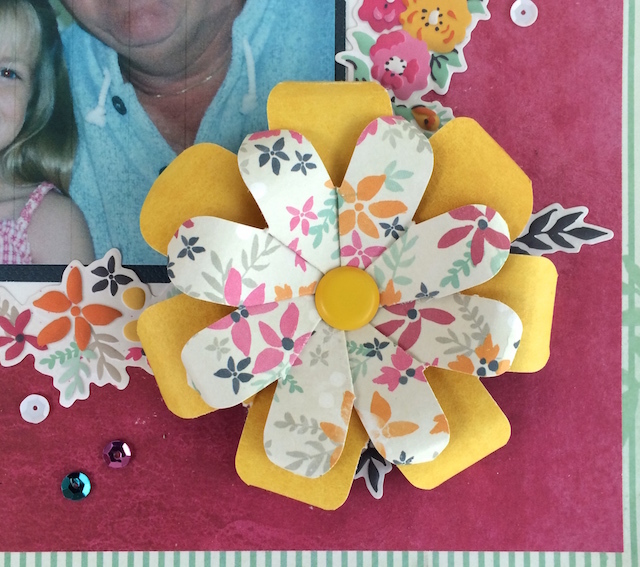 So whether you want a more dimensional look, or a flat embellishment, the Flower Punch Board can help you make fabulous flowers to spruce up your scrapbook pages! 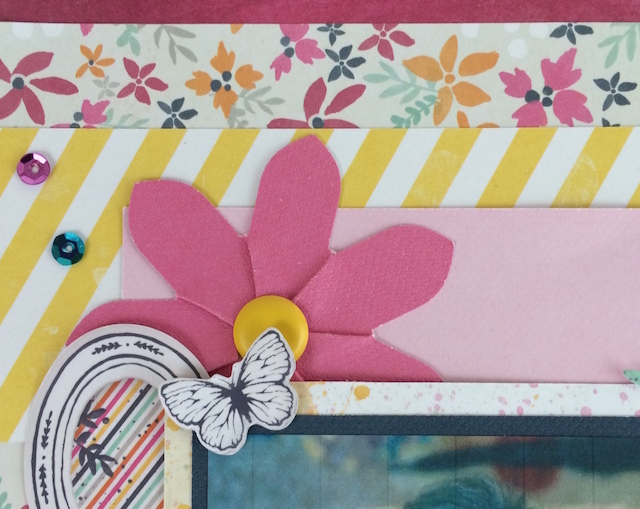 I’d love to see how you are using your Flower Punch Board on page layouts! Share pictures with us on We R’s Facebook page! Thanks for stopping by today! Hello! Aly Dosdall with you again today. We all know that We R Memory Keepers turns out the most innovative tools in the industry to help create amazing (and easy) paper craft projects. But did you know that they’ve taken things one step further by offering complete paper craft kits that only require some assembly for those times when you’re short on….well, time? One of those is the Crepe Paper Flower Kit. 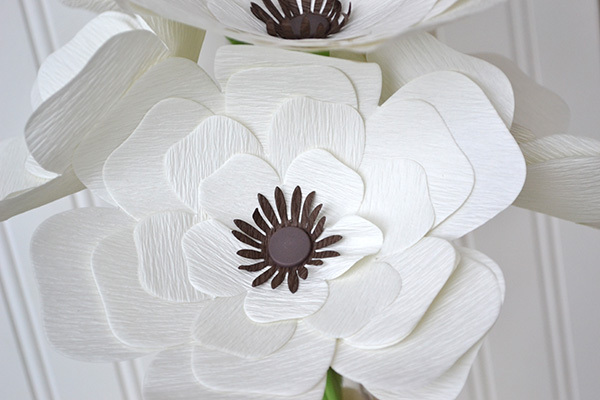 Perfect for weddings, showers, anniversary celebrations, graduations and more, these beautiful multi-layer flowers are easy to assemble, come in several different colors, and look stunning! 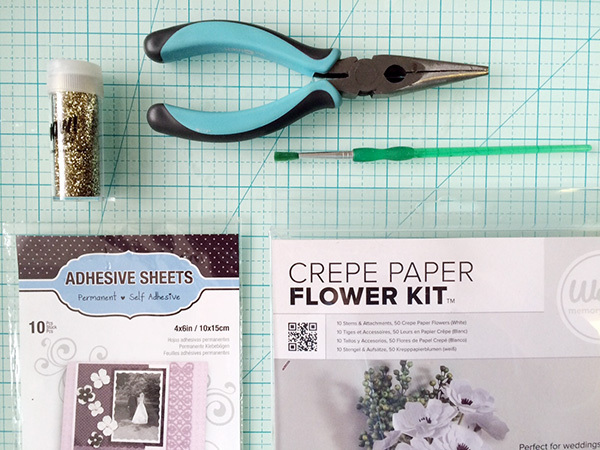 This kit comes with enough supplies to make ten 6.75″ layered crepe flowers with attachments and stems. You can leave them flat, or cinch the bottom layer to make them 3D. You can mix and match the layers leaving some out, or combine similar sizes to make your own unique creations. Simply insert the attachment piece through the pre-cut holes in the flower layers, add the bottom attachments and the stem. 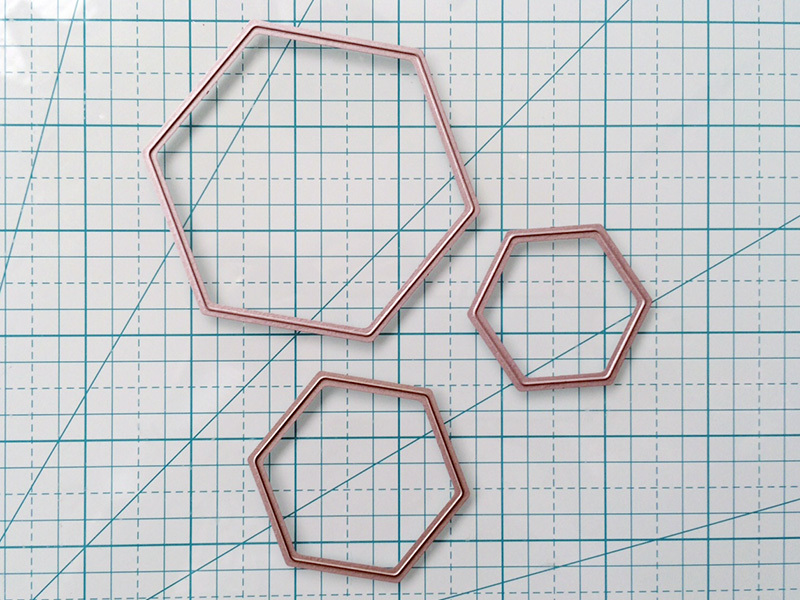 Use our Cinch Wire Cutters to trim the stems to the desired size. Once I created my bouquet of flowers I placed them in an empty soda bottle that I picked up at a local craft store for 99¢. 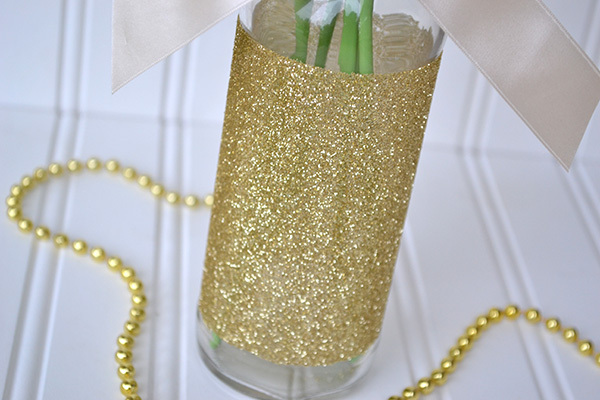 I dressed up the bottle with some glitter–it was easy to do using some clear adhesive sheets. After wrapping the adhesive sheets around the bottle, I rolled it in some Wow! Glitter by our parent company, American Crafts. After brushing the stray glitter off with a small soft paintbrush, I added a champagne colored satin ribbon. This project would make a great centerpiece on a table, or accent piece in a display at a wedding, shower, or other formal celebration. Well, we’ve been through the April showers here and now it’s time to enjoy some gorgeous May flowers! 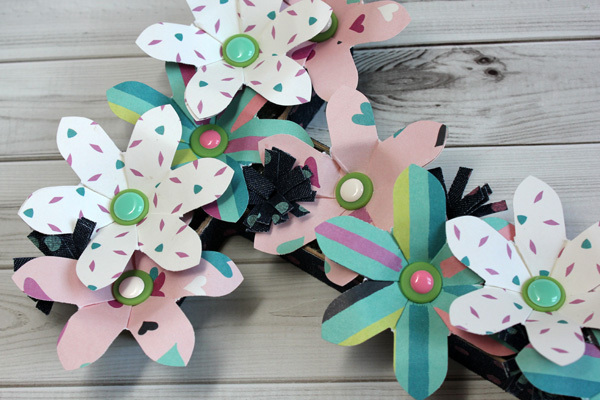 That’s right, it’s flower week on the We R blog and we’re going to feature some beautiful ways to include flowers on your paper craft projects. First up is design team member Kathy, and she’s got a gorgeous wedding gift set to share today. Enjoy! Hello, it’s Kathy here again. It’s the time of year for couples to say, “I do.” In fact, one of my nieces is getting married this month so I created a card and present for her using some of my favorite We R Memory Keepers tools and the Hello Darling collection. 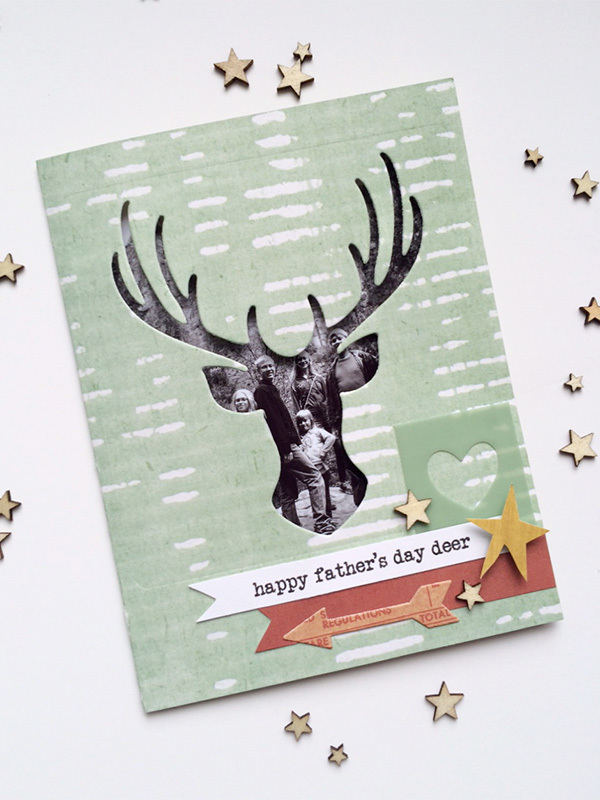 The card was made with the Evolution Advanced die cut machine. 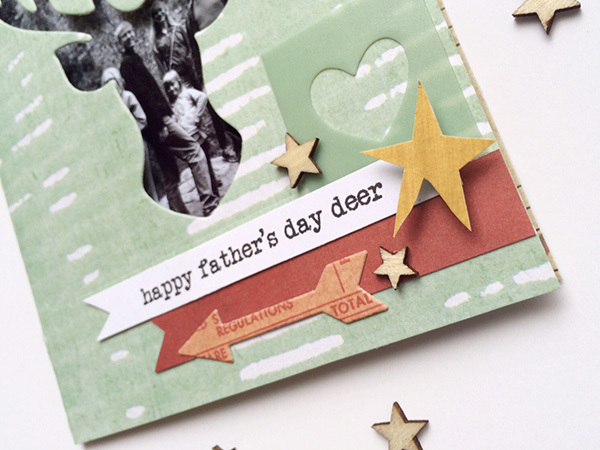 Included with my machine was a pretty scalloped rectangle die set that I used to make the card’s frame. 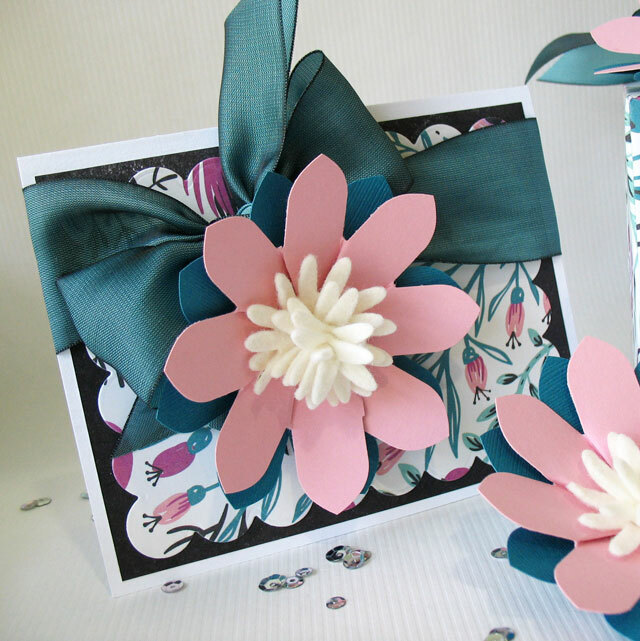 Accents include some yummy ribbon and a beautiful bloom made with the Flower Punch Board. I love how easily the Flower Punch Board makes pretty petals! To give my blooms a little added detail and texture, I added felt centers. 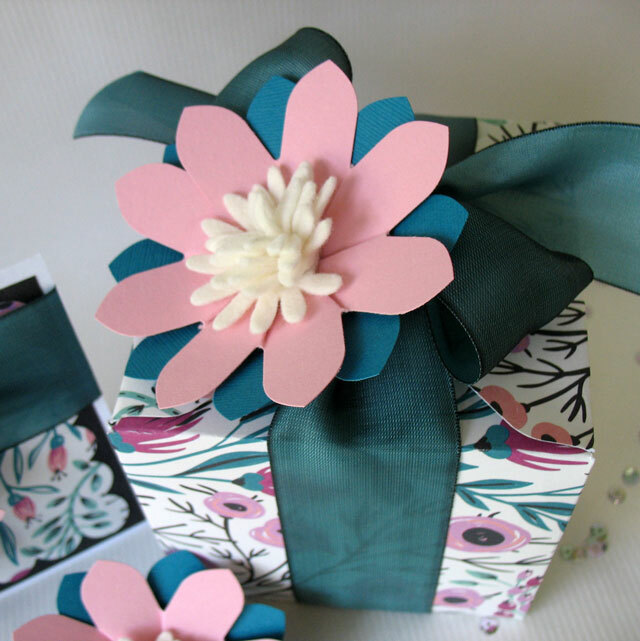 The gift box was easily created with the 123 Punch Board. I’ve made many of these lately…so fun! Inside the box I tucked a coupon for a hand crocheted throw. This way the bride can decide what colors and style of blanket she wants.